If you’re like most homeowners, a major benefit to a remodel is the ability to incorporate space saving methods into your home. From baths and kitchens to bedrooms and laundry rooms, we love working with clients to create the perfect balance of design and efficiency. Going back to the Saratoga home remodel, we worked with the client to develop the idea of a clothes pole over the sink as a space saving strategy. Convenience. 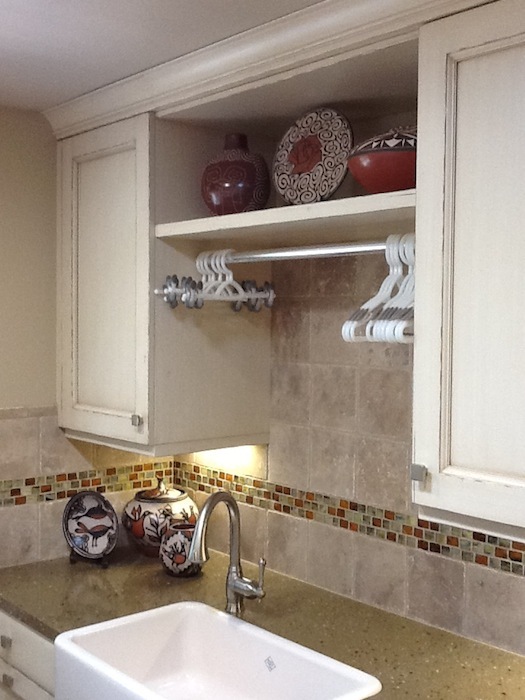 As the homeowners take clothing out of the washer or dryer, they can hang items up. Because it’s directly over the sink, it’s ideal for those hand wash only garments, too. Practicality. Although it might seem simple, a lot of space saving opportunities are wasted, and this is a practical way to make more room in the laundry room as the homeowners don’t need to pull out separate drying racks. Durability. The countertop in the laundry room is designed to handle moisture, so if wet clothes drip on the surface it will still last for years. What space saving ideas have you seen that might be fun to incorporate? Whether you’re remodeling the laundry room or the entire house, give us a call and we can help you come up with a design that will work for your home and budget!